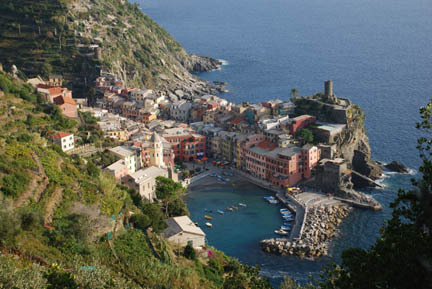 The Cinque Terre (The Five Lands) are on the northwest coast of Italy, not far from the Riviera. The coast is very mountainous and has steep hillsides and cliffs running right into the sea. There are five villages along this coast, four in valleys at sea level and the middle one on a ridge. Wine and olives were the big industry here before the 1930's. 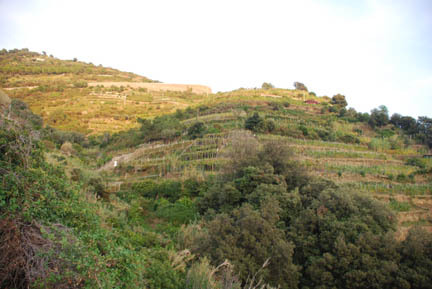 For hundreds of years the citizens had fished the sea and terraced the steep rocky hillsides to grow grapes and olives. The villages and their crops were only accessible through a network of trails joining them together. The entire length form the southern village to the northern is about 12 kilometers (7.5 miles). 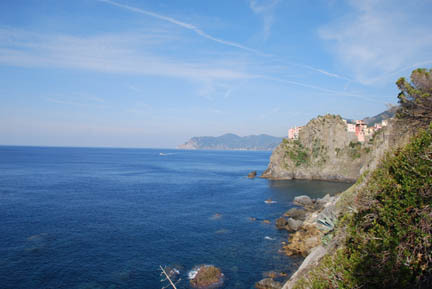 They are named (south to north) Riomaggiore, Manarola, Corniglia, Vernazza and Monterosso. Today each is in a narrow valley with steep sides, or on a ridge with steep sides, and although each has a narrow, windy road leading to it, tourist's cars are not allowed inside the village. In fact most locals also have to park outside the towns because, except for the main road, the "streets" are stairs up or down the valley sides.. This picture is from just north of Riomaggiore looking past Manarola to Monterosso centered, at sea level, on the distant ridge. The 1930's saw a disease appear in the grape vines, nearly wiping out the industry, and the arrival of a railroad that punched through the ridges and connected the towns by rail. Today the major industry is tourists that come to walk the trails. And that is why we're here. We stayed at a campground in Levanto, which is about seven km. north of the northern town and is connected by trail and rail to the rest. It would like to be considered part of the Cinque Terre but officially is not. It is larger, flatter and allows cars! 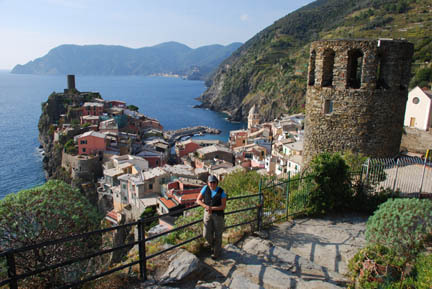 The Cinque Terre is a UN World Heritage Area and a Italian National Park. To walk the trails requires a pass or ticket. We bought two-day passes that allowed us unlimited trail and rail trips. 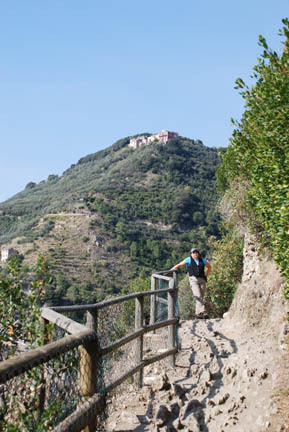 We decide to go to the southern end and walk back, mainly because the best trail section, and the most famous, is between Riomaggiore and Manarola. 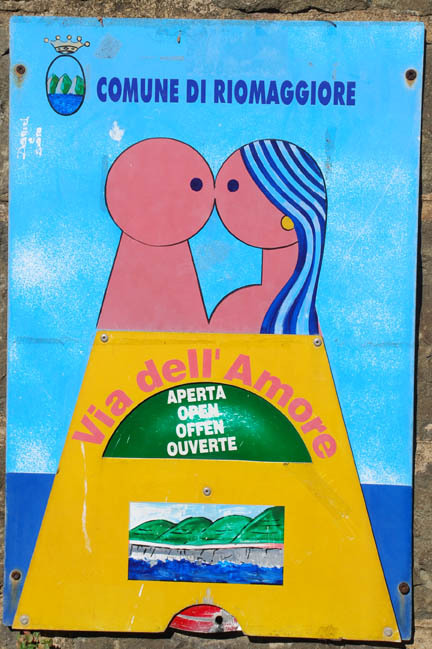 This is the famous "Via dell' Amore" or Lover's Trail. It runs along the cliff face about 100 feet above the sea with spectacular views up and down the coast. The picture above was taken there. It is a flat trail well paved with flagstones cemented in place. 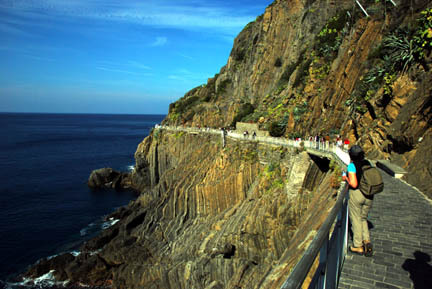 It is accessible by wheelchair with an elevator from the train station in Riomaggiore. The big detraction is the huge amount of graffiti left by lovers who want to immortalize their love. Their names are written and scratched onto and into every surface flat enough. The rocks, cactus, stone walls, etc. are covered with their names and dates. This section is easy, level and short, only 1 km. and a half hour walk. The rest of the trail is vastly different. The old stone surfaced trails are badly eroding. The surface was once dry-laid flagstone, but today many stones are missing, others tilted, and the bedrock shows through. And then there are the stairs, thousands of them. Most as badly eroded as the trail. Maintenance has been nonexistent on most of it. Most of the terraces are no longer farmed. Today there are only 100 hectares (250 acres) in production out of the 1400 hectares (3500 acres) a century ago. And the trail has a lot more use than it did in its farming days. The tourist traffic far outnumbers the farmers. We saw at least a thousand people on the 12 km., and that was a Tuesday in the middle of October! What's it like in the high season? and the vineyards climb the terraces. Except for Corniglia the villages climb from the water steeply up the hill. 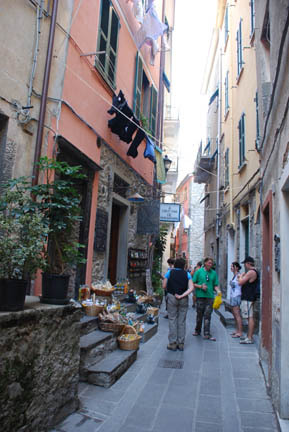 The streets are narrow footpaths and often have steep stairs on them. The old buildings are filled with souvenir shops mixed with cafes and small stores for the locals. 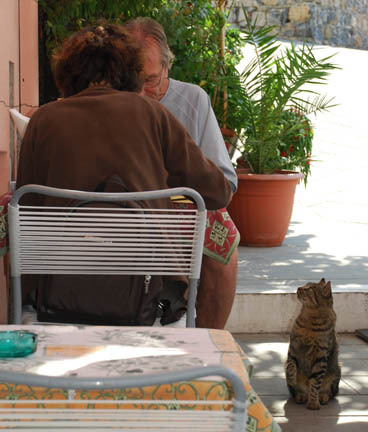 The area is also known for its cats. I have never seen so many friendly cats. Most cats I know don't get along well with crowds of people all coming up and petting them. These seemed to enjoy it and would beg for food or petting. 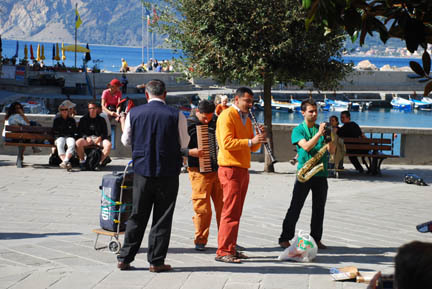 One day we had lunch at the harbor side cafe and these guys were playing music for us, and selling their CD's. I guess the cats weren't the only ones needing attention. They were actually quite good, playing mostly "Big Band" music from the 40's. We walked 3 of the 4 sections of trail and decided to take the train back and finish the next day. But first we had a beer in this town, down in the harbor cafe. While sitting there I realized that the point I could see up on the trail would give me an excellent view of the town. So before boarding the train we decided to walk up and take a picture. It was farther than I thought! But I got this picture. People coming down the trail said we were almost to the high spot, so we decided to continue on and finish. This is one of the longest and roughest pieces of the trail. We climbed about 400 feet and then made small ups and downs on a badly eroded trail. It was difficult walking, especially after having done all the rest of the trail. I'm not in as good a shape as I once was, and Kathy has never done all that much trail hiking. But we made it to the down part. 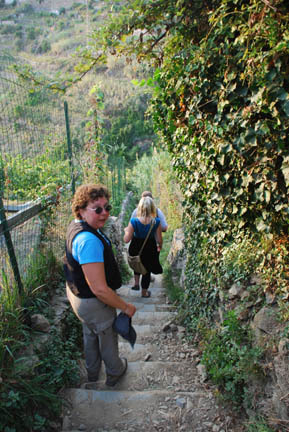 This was an area of long sets of steps working their way back and forth and down the hillside and through the vineyards and some lemon groves. The trail is fenced in most places where there are crops to be saved from the tourists. 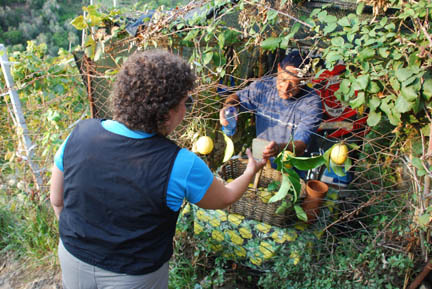 This guy had cut an opening in the wire fence and was selling fresh squeezed, hand-made lemonade for two Euros a glass. An outrageous price, but well worth it. It was late afternoon/early evening, we were tired and very appreciative of his tasty drink. From here we made it to the last town on the trail. We had walked a total of 12 kilometers and climbed to about 600 foot elevations twice, going back to sea level in between. About the same as we walked in Gibraltar but that was on paved roads. This was more difficult and I found that my motorcycle boots don't make good trail boots! There is no ankle support and with the rough rocky trail they needed some. 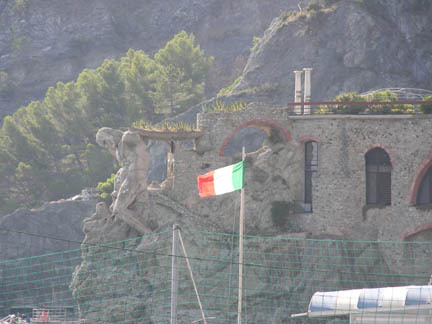 In this last town, Monterossa, we found this sculpture on the point near a hotel. No description, but it was sure interesting. The second day we took the train back south and walked the lover's trail again and then train hopped between towns and explored the back lanes alleys and bought more stuff to bring home. 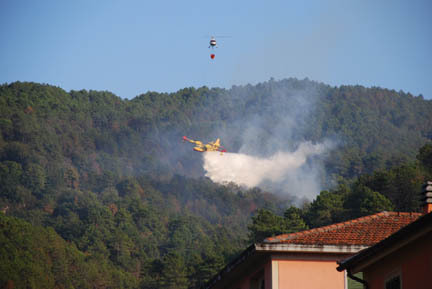 When we got back to Levanto and were walking to the campground we saw the aerial attack on a wildfire in the valley about a half kilometer above the campground. I thought about volunteering, but I left my Red Card home and couldn't prove I was qualified to fight the fire! So we went back to camp and watched the aircraft fly directly over us until dark. The helicopter was making two trips to the plane's one. Both were dipping out of the bay on the edge of town (about 1/2 km. behind me as I take the picture). The campground is just behind the pink building in front of me. From here we are headed to Bolzano in Northern Italy to visit with friends vacationing from the USA.